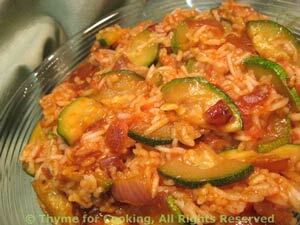 Tomato Rice with Zucchini, Thyme for Cooking summer side dish. I don't normally put zucchini in my Spanish Rice, Cooking it separately and adding it later seemed to bring out the best flavors of both the rice and the vegetables. Check the rice towards the end of the cooking time; you may need to add 1 - 2 tbs of water, depending on the tomato. Finish with hot sauce if you like. Cut the tomato in half. Cup half of a tomato in your hand and rub it on the big holes of a box (or other style) grater until all that is left in your hand is the skin. You'll have to press a bit, but not too hard, be careful not to grate your hand. Put grated tomato, rice and stock in small saucepan, cover and bring to a boil. Reduce heat and simmer until rice is tender, 15 - 20 minutes or however long your rice package directs. This recipe assumes a 2:1 ratio of liquid to rice and was adjusted to use the tomato. Cut zucchini in half lengthwise then each half in half again. Slice into 1/4 inch thick (.6cm) quarter-circles. Heat oil in nonstick skillet over medium heat. Add chili powder, onion and sauté until just starting to get tender, 5 - 7 minutes. Add zucchini and garlic; sauté until zucchini is tender, 10 - 15 minutes longer. Stir rice into skillet with zucchini and serve.